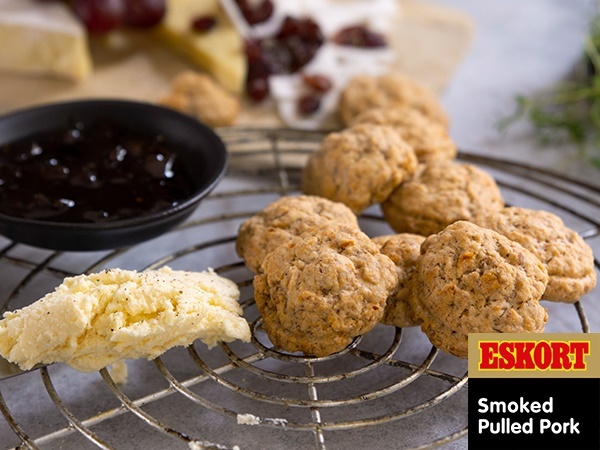 Sundried tomatoes and smokey pulled pork mixed into a sweet cookie dough creates a #JustDelicious unexpected flavour combination. In a large mixing bowl, add the sugars, butter, vanilla essence and egg and whisk together until well combined. Sieve the flour, baking powder and salt into the butter mixture. Using a wooden spoon, combine the mixture until a ball of dough forms. Add the pulled pork and sundried tomatoes and mix well. Shape the dough into tablespoon-sized balls and press flat on a greased baking sheet. Store at room temperature and enjoy whenever you feel like having a #JustDelicious snack.